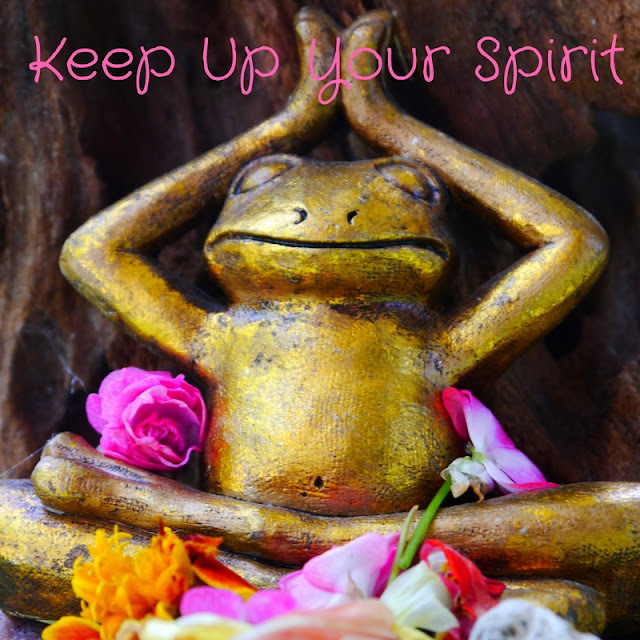 One of my favorite Kundalini Yogi Kriya's is called "For-Keep-Up Spirit." One of the things that is big in Kundalini yoga practice is to "keep up" To keep going even when you are tired or want to stop. To keep going even when you are on the verge of giving up. To keep up with the breath even if you can't keep up with the physical movements. This morning I was doing my morning practice. I did a kundalini set to reduce stress and anxiety. I haven't done this particular set in awhile and it took me a little while to sink back into this particular kriya. I wanted to give up this morning but yoga is often a reflection of life. I always feel what I take to the mat I also bring into my day today life. I thought about how I've let my anxiety and fear get the best of me in the past. Lately my anxiety and stress have been creeping back up again. As soon as I think I've shaken it, it had a tendency to show back up. Of course, I've been learning a lot about the menstrual cycle lately. More on that later. I thought about the times I gave up out of fear. Or when I subconsciously pushed things away out of fear. Our mind has a lot more control then we realize at times. often times I didn't do things because I was afraid of the anxiety. Not because of the fear itself. Unfortunately, a symptom of having panic attacks is that then you are afraid that they will show up again. I haven't had a horrible panic attack in months. Maybe even a year. But, the fear is still there. In the back of my mind. This year I've decided to work with my fear. To feel my emotions and sink into them. Not dwell on them but feel them and acknowledge them. Sometimes our feelings just want to be acknowledged. Once we know what we are feeling then we can make an effort to resolve the issues that actually cause these feelings in the first place. In my yoga practice I decided not to quit but to push through and keep trying. This is a major resemblance to my life off the mat. This year I've decided to "keep up." To make my goals for the year and I've broken them down into smaller steps that are easier to manage. I love big dreams and goals but in the past I realized I never actually broken them down. I saw the end result but not the in between. And this is where my fear tended to creep in with insecurity. Also creating daily steps makes the bigger goal or dream seem closer to possibility. This year I will not give up. Even if it seems like my dreams and goals are hitting a wall, or I get burned out, or I feel like I don't have enough time, money, or energy to support my goals. But, I will keep up despite it all. If I get burned out I will take more time for self-care. I will save up the funds to reach my goals. I will listen to my body if my energy starts to wane. I will make the time and pencil it in my schedule. These are all ways I've discovered that I can nurture myself and my goals for the year. These are ways that I can keep up my spirit. Pick one or three goals this year that are really juicy and make you feel excited. When you picture yourself in 2019 what are you doing? who are you with? what self-care practices are you doing? What does your body look like? your spirituality? What goals make your soul come alive? What are things you've been on the backburner that you ache to get back to? Now pick one to three BIG goals. Now make a list. What can you actually achieve in one year. Be realistic this is not about burning yourself out. If you have more then three big goals and you know it will take more then a year to achieve make a 4, or 5, or even 6 year plan. I made a 5 year plan because I know not all my juicy goals are going to get achieved this year. But, I'm not willing to throw them out either. They just have to go on the backburner for a bit until they are ready to be birthed. But, I picked three major goals. Then break those goals down. what can you do for the year? the month? everyday? Can you spend an hour writing or painting. Or can you spend half a day on a day you don't work at your main job. Or maybe it has nothing to do with career but it is a sacred practice you lost touch with. Can you do it three times a week? Then once you figure out what you can do figure out how to nurture yourself. Self-care is the cornerstone for fulfilling our goals and dreams. If you start to get burned out or feel like there is not enough time what are some practices you can do to help you regain your energy and time? These are just some ideas. I urge you to make your own. have fun, play, and don't be afraid to dream big. What are your goals for the new year? How do you plan to support your body, soul, and mind while you fulfill these goals?